Occunomix LUX-SSETP2B Class 2 Classic Standard Wicking Birdseye Grey W / Reflective TapeOccunomix P529C3 Class 3 Polo Shirt with Grey Reflective Tape, No Safety Vest Required! 100% lightweight polyester in a moisture wicking "Birdseye" fabric provides comfort for this economy high visibility T-Shirt. No Safety Vest Required! 100% lightweight polyester in a moisture wicking "Birdseye" fabric provides comfort for this economy high visibility T-Shirt. Wicking material helps draw away moisture creating evaporation effect to help keep workers comfortable and dry. Features include one left chest pocket, 2" reflective tape: One 360° horizontal stripe, and two shoulder stripes. Reflective is heat pressed to help reduce skin irritation sometimes caused by reflective stitching. ANSI Class 2 third party certified for visibility. 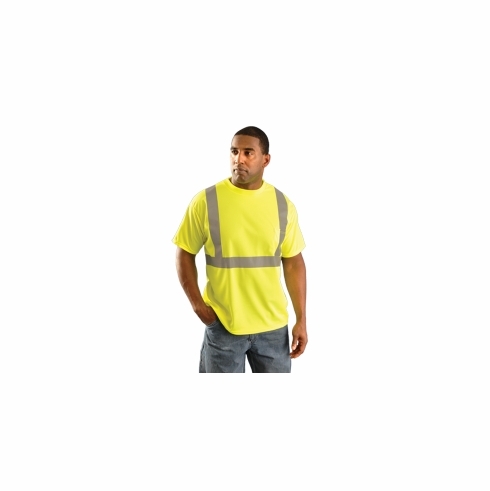 This hi vis T-shirt is one of our most popular products for work crews, construction, highway safety, equipment operators and many other industries where job safety and meeting standards is required. Manufactured by Occunomix International, a world leader in high visibility clothing.